When it comes to personal displays of creative expression, sports are generally not the first thing that pops into everyone’s minds. The team mentality, the matching uniforms – not much that really allows each player to showcase his or her own personal style or taste. However, as a designer (who spends more hours than one person probably should watching and discussing hockey) I instantly became drawn to the art of the goalie mask. Yes, the design typically fits with team branding, but masks allows the goalie to express their own style, heritage, interests and more in whatever way they so choose. 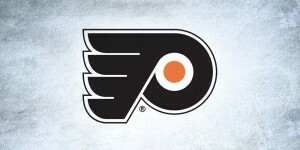 While there are always some restrictions on what can and cannot go on a goalie’s bucket (sorry, Jonathan Bernier) in most cases the sky’s the limit for the goalie and their artist of choice. I’ll be sharing some of my favorite goalies’ masks and hopefully, the 2014-15 season will bring some even more stellar buckets than the years past. 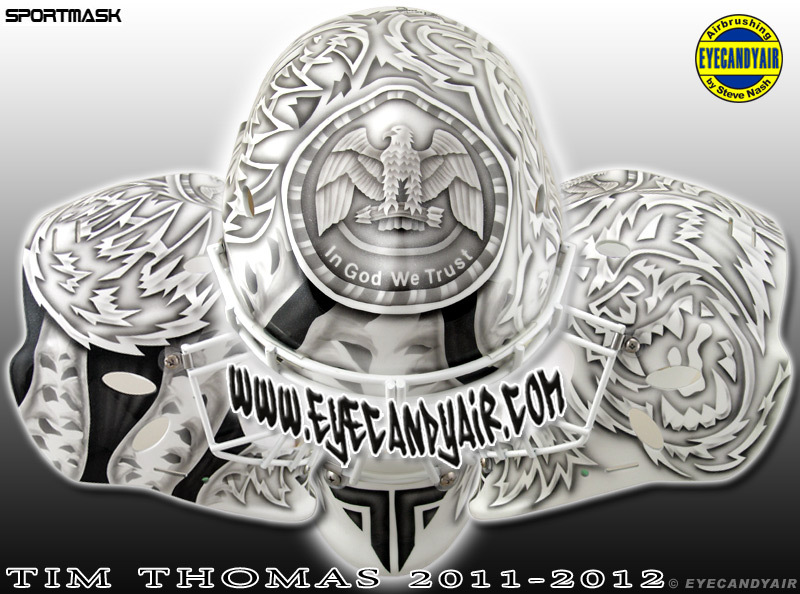 First up, one of my favorite netminders to watch who has worn some of my favorite helmets. He’ll be the first to tell you, he doesn’t need much tire-pumping from anyone, so I’ll just cut to the chase and get to the part about the masks. I’ve always had a soft spot for Tim Thomas in his Bruins days, but the evolution of his masks seemed to steadily improve along with his play. 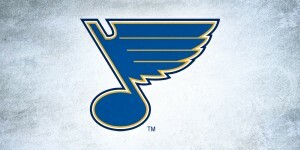 Now I’m not saying the 2011 mask had something to do with winning Boston’s first Stanley Cup in 39 years, but I’m not saying it didn’t either… can’t argue with design karma. 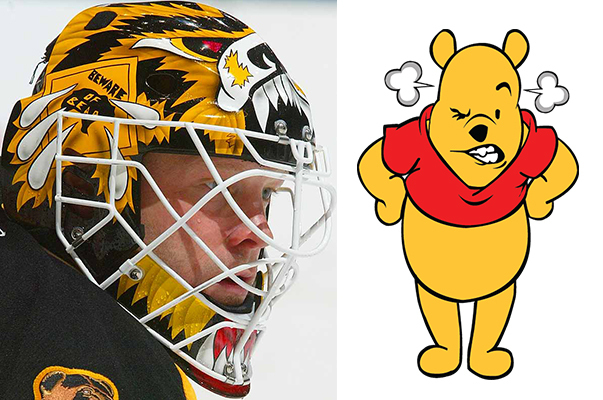 After a string of angry, yellow pooh bear mishaps, Timmy’s 2010 and 2011 masks are some of my all-time favorites. 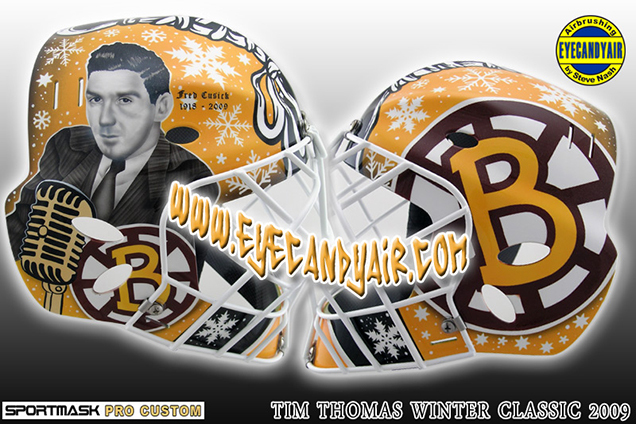 First up was the 2010 Winter Classic mask, paying homage to Fenway Park, the great outdoors, and the late legendary broadcaster, Fred Cusick. Painted by Steve Nash at Eyecandy Air in Woodbridge, Ontario, the vintage Bruins gold and retro portrait of Cusick worked flawlessly with the gold jerseys and the old school vibe of outdoor hockey in America’s oldest ballpark. 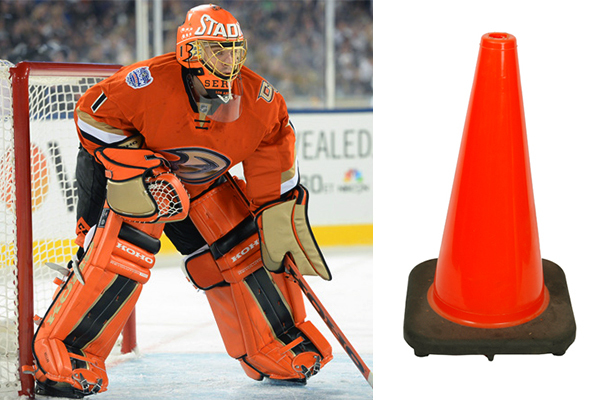 Even the best buckets can be ruined when they don’t work with the rest of the uniform (see Jonas Hiller’s “traffic cone” goalie motif) but the brown and mustard gold played perfectly off the colors and design of the jerseys and pads. For 2010-11, Nash created yet another masterpiece for TT, this time more abstract and subtle – quite different from both his past designs for Thomas and the netminder’s, um, animated personality. 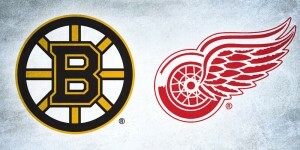 While many criticized Timmy and interpreted the white-on-white design as a deliberate “stripping” of the Bruins colors from his gear, with a closer look, the design reveals itself as an abstract interpretation of the Bruins’ bear. The design still represents the team while also representing Thomas himself, showcasing an illustration of his lucky coin front and center. 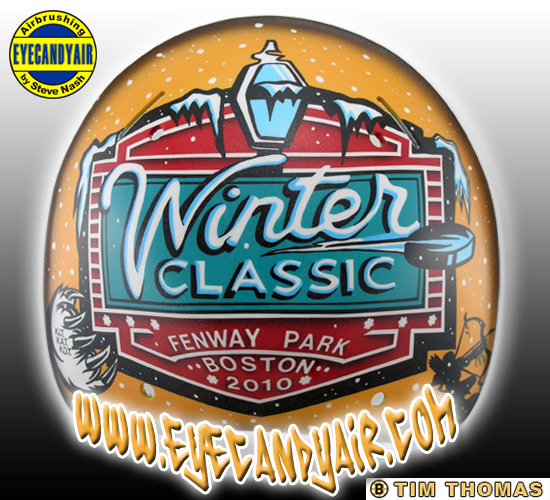 Among a sea of Ed Hardy-esque, overly-complicated helmets, Timmy’s 2011 design stood out as a pleasant departure from the common league trend. 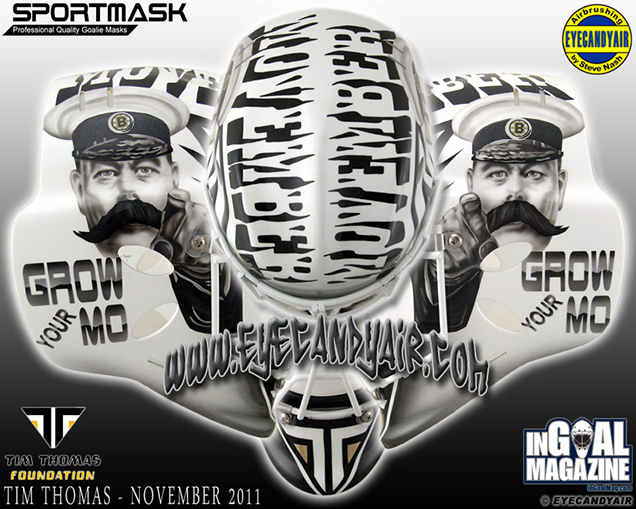 Thomas’ regular 2011-12 bucket didn’t change much from the previous season’s Stanley Cup-winning design, but Timmy showed his support for prostate cancer – not only with his own epic ‘stache – but with a special Movember mask. Another refreshing departure from the flashy, splashy Ed Hardy trend, the clean typography and minimalist black on white was both eye-catching and bold. 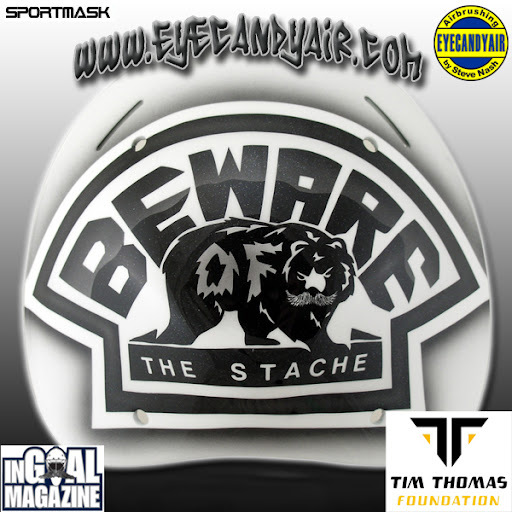 Thomas autographed and raffled off the mask for charity after November’s end (when the Bruins went 12-0-1 may I add). Plus, the “Fear the Stache” bear with a mustache of his own on the back was a nice (and quite humorous) little touch. Check back for more mask rundowns in the coming months!